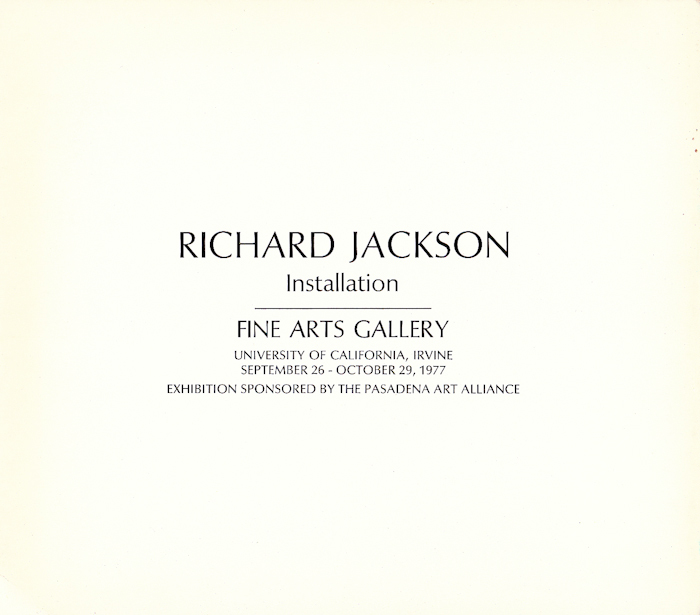 Richard Jackson’s early interaction with artwork was behind the scenes. Preparing works for installation at the Pasadena Museum made him very aware that many works lost their visual power when a viewer stood at a far distance. This evaluation inspired Jackson's philosophy of having solely site-specific installations. Influenced by Jackson Pollock, the artist proposed that artwork had a specific, particular space with its own inherent characteristics. He had an “aptitude and inclination” for building, inspired by his academic training in engineering. Most of his works in the Irvine gallery are three-dimensional, utilizing the surrounding space as a part of the works. Literally and figuratively, Jackson's work deliberately challenges the viewer to engage with art. By constructing his grand colorful works of art with meticulous detail, Jackson’s work stimulates a unique visual and spacial relationship with viewers.